Neoliberalism is the world's most valuable company getting a tax break from a state that cannot afford to fix its subways or fight hunger, while the company's founder gives a sliver of money away and is described by the media as a "philanthropist." It is hard to think of a story that better distills the perversity of our age of capital hegemony. The state working to serve corporations, not corporations being managed to serve the public. There may be a way for Amazon to enter that minimizes damage and maximizes welfare. But that starts with refusing tax breaks, embracing unions, and working with leaders like @Ocasio2018 and local groups to do right in ways that may come at the expense of doing financially well. As @JeffBezos embarks on his journey as a philanthropist, he should consider that we may all be better off if he channels the noble giving spirit into the operations of his company rather than into a foundation built off its profits. We don't need him to give back. We need him to take less. We don't need him to solve problems. We need him not to cause any. We don't need him to be generous. We need him to ensure that his company's practices are just. Otherwise, when you take tax breaks and bust unions by operational daylight and then "give back" by philanthropic moonlight, you're canceling yourself out. You're fighting on both sides of a war. And what you do in your day job is almost always the victor in the conflict. If we want to live in a New York with an actual, surviving middle class and with actual, surviving stores and local businesses, it's going to require that Amazon be unlike what it's been. Don't start by taking tax breaks. Start by working with local community groups. 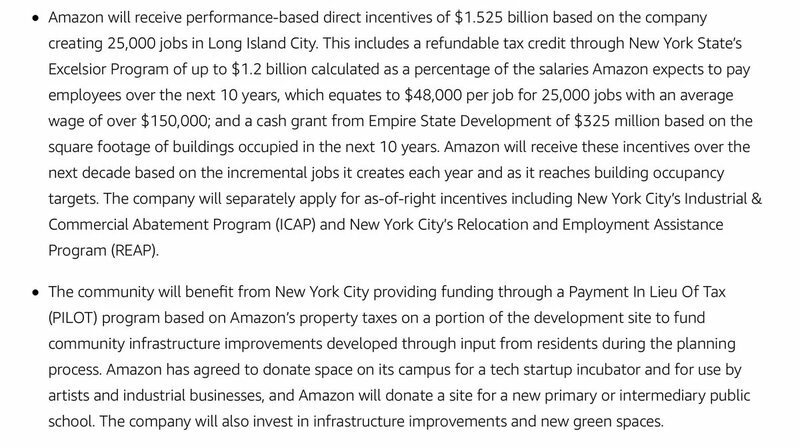 Amazon says it is getting $1.525 billion in incentives from New York, through a tax credit and a cash grant. This is the future. Companies getting a tax break to let hipsters and entrepreneurs use some of their space.